Reviews | #8 Round Squeeze Handle Disher Portion Scoop - 4 oz. #8 Round Squeeze Handle Disher Portion Scoop - 4 oz. Constructed entirely of 18-8 stainless steel, this 4 oz. #8 round disher has a squeeze handle design that allows you to use your whole hand instead of just your thumb to activate the blade. This cuts down on fatigue with extended periods of use. The blade extends beyond the bowl to prevent sticking and it is for use with either left or right hand. Best for softer foods and low volume use. I use these scoops to measure out scoops of batter for baking. They last a long time and can be used daily for long periods of time. Good product, I strongly recommend it. It is easy to handle and it makes perfect scoops. Good size portion. Good product at a very competitive price! This round squeeze handle disher portion scoop is perfect for portioning our plates with ease. The handle is very sturdy and I definitively recommend this product. Good addition to our kitchen equipment. Does exactly what you would expect, the full metal construction makes for an extra easy cleanup and drying process. I like the size of these, but they were not very sturdy. Ours broke after a couple of uses but were not worth the return shipping or restocking fee. This 4 oz. stainless steel scooper is the perfect size for portioning out sides into monkey dishes. They are a great price and easy to clean. They last a long time! Love these scoops. I have a variety of these scoops to get the perfect portion control. All of my items come out equal and perfect. If it is for cookies, cupcakes, muffins, etc. They all come out equally the same size. With portion control. I’m able to bake at a time. All goodies come out perfectly baked to perfection. This is a great disher at a great price. Ones locally sell for twice as much or more for the same item. The two handed design is easier to scoop for me than the thumb ones so I always get this style. We use this scoop daily in our school foodservice operation. Easy to use, inexpensive, doesn't stick between scoops, and is easy to wash. Great buy. The 4oz size is great for muffins. It is sturdy and scoops thick batters evenly and easily. The mechanism is relatively smooth. Can be tiring after repeated use though. This is a great, stainless disher. Perfect for high volume with its quick release, and easy to clean. Potatoes, ice cream, rice etc all are easily served in this great scoop for portion control! perfect scooper to scoop 4 oz of meat into my 4oz cups. Work is done effortlessly and stress free. Bonus i finish faster and cleanup is a breeze. I love this portion scoop! It is easy to portion foods out or to portion ground beef for burgers. The squeezer is comfortable and saves a lot of time! This is the perfect sized scooper for proportioning mashed potatoes, macaroni and potato salad and many more items. It doesn't hurt your hands, even after extended use. This serving scoop is just the right amount for any sides during an event. Easy to keep track of how much product is going out to the clients. I would highly recommend! This ice cream scooper works well and is really easy to clean!! I also use it for scooping cold butter and other condiments for presentation points. These work great ! Be careful when tapping it on something to get food off it, it'll weaken and the moving parts will break. 2/3 I've bought in the last two years still work! Proper portioning keeps the budget in check and this portion scoop does just that. A perfect 4 oz portion every time and very quickly which is important when doing the days prep work. A nice sturdy scoop that is perfect for dishing out all of our sides of potato salad, cottage cheese, & pasta salads. I've had lesser quality scoops that fall apart. I've not had a problem with this scop doing that. Excellent serving size for birthdays, especially for kids, can be handled easily and the squeeze function doesn't make noise like other scoopers I've used. Would highly recommend. I didn't know that scoopers came in such a large size! I am so pleased with the construction of this scoop as well. I measure out all my batter for cakes and having a 1/2c measure makes it a lot faster to get the batter into the pans. Plus, I wont need to use a spatual in a standard measuring scoop because these scoops have a lever! LOVE THEM! This is such a great product. I love that it is stainless steel because it looks great in my kitchen. It also works great. I use this for ice cream,. sorbets, mashes potatoes, or just portioning out other food. Its bigger than what i expected! It worked great when scooping ice cream for those cone bowls made for ice cream! I think its a bit too big for cones that are small. I was able to use it and it did the job! Quality is great! I still need some practice on using it. Overall its a good product when serving bigger portions! its a great size for scooping ice cream unto ice cream bowls! I purchased this scooper to use at a mashtini bar for guest to scoop mash potato's into a martini glass. This is the perfect size for what I need it for. The squeeze handle makes it easy to grip and squeeze with ease. This will be beneficial to older people attending my event who may have an issue tightly squeezing. The cost was about average to what I have seen in other stores but webstaurant sells such good quality products that I added this to my order. I use this scoop when making cup cakes. Gives me a perfect 1/2 cup every time. It can be used in left or right hand which is awesome. I particularly love this scoop because I am left handed and the normal thump-push-type scoops do not work for left handed people. The squeeze handles is also much better because it doesn't fall into the food you are scooping. This scoop is preferred because it works well for right and left handed people. The scoop is fuller in one swipe and clean-up is a breeze. One should use the waffle bowls with this scoop for ice cream; because the portion is generous. This is a great product for such a low price and very durable. I would not recommend this for cupcakes, as it is to big, but is great for portioning out cake batter or anything else. I bought this for my 4" pans for individual coffee cakes and mini cakes. It works great, creating a consistent and controlled portion. It is comfortable to use as well. 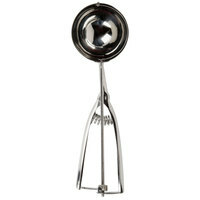 This is a great disher for soft batters (like muffins) or cake batter. I prefer the squeeze function to other types available. If you are looking for something more sturdy try the Zeroll scoops - they're a favorite of mine. That said, this is a hefty portion for cupcakes and muffins - the standard to fill my cupcakes liners is between 2 and 2.07 ounces. We are very satisfied with this #8 disher. After many uses it has held up very well for us. The price was right and we would recommend this product. I love the portion size of this scoop. It was very easy to handle. It is absolutely the perfect size for any social or fundraiser! A great sized scoop for serving side dishes. Allows us to serve up holiday meals fast and evenly. Gives mashed potatoes that traditional look that everyone expects. Sturdy item. Perfect size as an ice-cream scoop but also for cupcakes and muffins. I use it for making fish cakes. Great for dishing out mashed potatoes and so much more. A nice large scoop. We use it for jumbo cupcakes as well as for scooping filling into our larger cakes. Allows for nice uniform sized cupcakes. Great scoop for cookie dough. We use it to make sure our cookies are always the same size. Works nicely even with a firm dough or dough with nuts or chocolate chips. The #8 stainless steel disher is the perfect size for forming crab cakes, and also a good size for portion control and plating of rice, potatoes, and similar products. Very sturdy product. This disher is very well constructed and easy to clean. The size of the disher means how many scoops it would take to fill a quart. So #8 means 8 scoops makes 32oz. Very happy with this product, will be getting many other sizes in the future. I wanted a bigger size scoop for cookies and I got it! This scoop makes those huge cookies you can purchase for an arm and a leg at most high end sandwich shops. Perfect size scoop for making jumbo cupcakes and muffins. It allows me to fill many pans quickly and evenly every time. A huge time saver. I'm on a diet and I use this Disher to help me portion out my food in 4 ounce servings. This makes my life easier. This disher is perfect for my crab cakes. It comes in handy when I have to make several hundred of them and can do it so easily. These dishers are great for serving portioned items. I use them when packing luncheon orders to go. They help with uniform packaging and assist in determining how much to cook. Nice sturdy portion scoop. With several sizes available, we can watch our costs by measuring the exact amount every time. Great price for this item. Highly recommend. Kinda flimsy but works for portioning. Much cheaper than at my local supply stores. Just as I expected, clean neat good product, and what I was looking for. This scoop works wonderfully for our restaurant needs. It holds up well, cleans easily and makes perfect 4 oz. scoops everytime. I highly recommend this scoop for anyone who makes any type batter balls. We have been using this for our mashed potato and mac and cheese meals (only during the Thanksgiving and Christmas Holidays). Considering it sits around unused, it doesn't show any age! Nice disher portions scoops. I actually bought them to portion mash potatoes at our restaurant to control food waste and consistency. I gave it 4 stars just because after only one time serving 1 scoop of ice cream it broke. I know it's not meant for ice cream, but still I have other scoops that can scoop ice cream with no problem. Bought this as a present for my daughter who loves to bake. She has used this product and loves it! She has even requested a few more. I do not like these scoops at all. I purchased them to use for scooping out muffin batter and cookie dough and they just break too easily. After 2 months use, the handle disher portion part broke and now its just a scoop. We had to go to a more expensive model as heavy daily work is too much for this model. These scoops work marginal, if you are using them for harder items such as cookie dough or ice cream they will not hold up. For scooping batter they work fine. Not sure about this scoop, it arrived in the box & the arm inside the scoop is bent also there is a ball bearing inside the spring. I used it and it appears to be okay just not sure about the quality of this product. We appreciate your feedback! We’re sorry this has not worked well for you. Please remember our Customer Solutions team is there to help with any issues you have. I use this scoop for my jumbo cupcake batter. It is a little big but I like that it is exactly 1/2 C. so I can use it for other things as well. The only downside is that it is not that comfortable in your hand when you use it for a long period of time. love the size and quality. it's bigger than what i expected but perfect size for serving side dishes and it's so easy to clean. Will purchase in a different size. Very good scoop. Sturdy and easy to clean. Large size makes it easy to scoop out batter in to my jumbo muffin pans. One day we had an ice cream party. I decided to use this big scoop and the kids went wild at the size. Their big eyes and smiles as they looked at their cone with huge scoops of ice cream were just too cute. One kid said "Wow! This is bigger than my head!" haha I made sure to send them outside to eat them. Mama didn't raise no fool. They can make as big a mess as they want outside. Was a fun day. My only problem is it seems my scoop has disappeared recently. Am guessing a family member decided to "borrow" it last time we had a party. Will be getting another one soon. sorry, but this product broke in less than a week. It was not handled roughly. It broke where the handle connected to the scoop. I feel as though this product is poorly made. The price was great, but quality was not. We are sorry to hear about this problem. A Customer Solutions Representative will be contacting you to see how they may help and determine if it was a faulty product. If you are looking for a more durable scoop, try the Vollrath 47391 Gray #8 Squeeze Disher Portion Scoop.